I don’t often come across Aluminum display and scan hooks. But when I do Aluminum Hooks almost invariably are bent and misshapen. 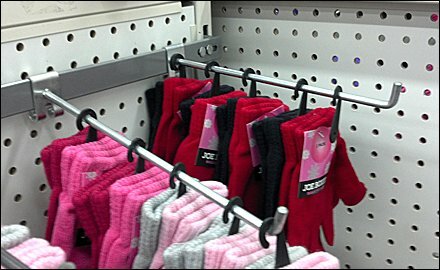 Even here supporting only light winter gloves. Sorry Aluminum. I really like you as a material, but just not as an untempered metal hook, like these Bar-Mount 90° Tip Display Hooks. SEARCH “90° Tip” for fixtures with this tip configuration.